For anyone who has bought or is thinking of buying the Geo-Dome plans I''ve made a list of commonly asked questions, this should answer most basic questions, if however you have a question not covered below please feel free to contact Paul. All measurements for cutting timber, making patterns, door and window openings and base beam sections. Instructions for building patterns, making the triangle frames, joining the frames together, making doors and windows. Free email support so if you get stuck or need advice on covering with other materials, building a bigger or smaller version or any other help just drop me an email. Do plans come in metric or imperial measurements? The Shop has both metric and imperial plans, if you can''t find the metric or imperial size you are looking for I can make plans in most sizes and provide measurements in feet/inches or millimeters, just drop me a line. How will I get the plans? Plans are sent via email in PDF format, I send them out in the evening after work manually so it may take up to 12 hours to receive your plans, depending on the time zone you are in. PLease white-list geo-dome and check your junk folder if you have not received your order within 24 hours. Can I get a hard copy of the plans? I don''t send hard copies because of the extra costs and time delay, each set of plans would need a different postage cost depending on the country and it could take over a week to get to some countries. We like things fast and simple and find that PDF files are quick to send and update and if you need more diagrams I can easily send them via email. For customers who like real paper I will be publishing all the plans in booklet format which should be available in the Amazon store early 2015. Not at the moment, there are free dome calculation tools and the YouTube video tutorials are free to view, so if you are good with maths or technical drawing software you should be able to build a dome without the plans. I don't have paypal, are there any other payment options? PayPal is the only payment gateway I use at the moment but I can arrange payment by direct bank transfer or you can send a cheque (GBP only) I''m working on other payment methods so if none of the above work for you drop me a line as I may have more payment options available. 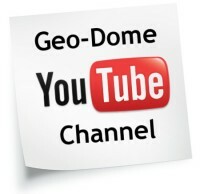 Are the geo-dome plans the same as others on the market? No, all of the Geo-Dome plans have beed designed from the ground up by Paul and are totally unique to anything else on the market. For example the 2v and 3v Geo-Dome plans have a single dihedral (bevel angle), the standard 2v and 3v both have two bevel angles. The geometry on all the plans has been optimized to reduce the number of different parts and machine operations so that construction is simple and efficient. What copyright restrictions are on the plans? All intellectual property rights are owen by Paul Robinson (traing as Geo-Dome) copyright issues can be complex so here''s a bullet list of the can and can''t basics. Build as many domes as you like for yourself or your freinds as long as you are a none commercial entity. 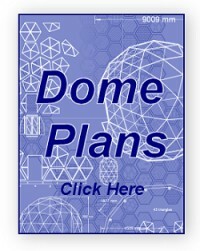 Send plans to a third party who needs the information to build a dome for you. Like a joiner or handyman. Publish, sell or otwise distribute any drawing or information in the plans without written concent from Geo-Dome. 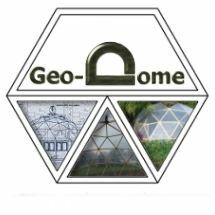 Build domes comercially using the plans without a written royalty agreement from geo-dome. Do I need to make or buy hubs? No, the building system with all of the plans does not require you to make hubs or have any other special jointing system, the bevel angle takes care of the need to make hubs. How do I cut the bevel angle on the struts? You''ll need a table saw with tilt function, most table saws will allow for the blade to tilt, you''ll also need a digital angle gauge to set the saw blade to the correct angle because most small table saws don''t have very accurate tilt settings. Can I see some finished domes? I can''t find the size or style I want to build in the shop? No problem, I can do custom plans in pretty much any size or style to suite your project requirements. Drop me an email with your requirements.